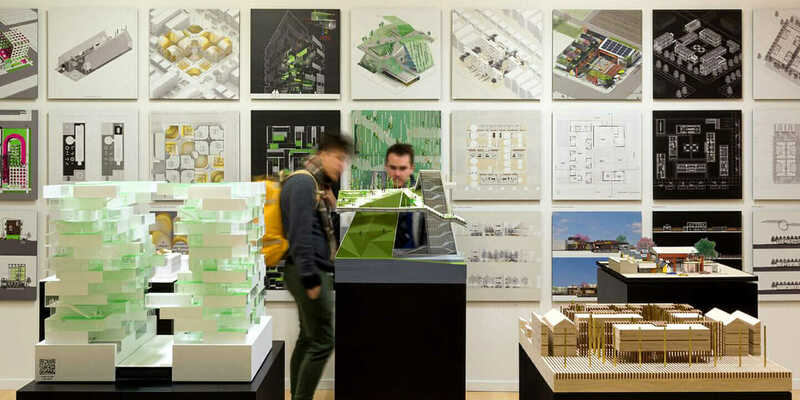 The Available City exhibition at the Chicago Architecture Biennial. Courtesy David Schalliol. David Brown’s Chicago Architecture Biennial project, The Available City, responds to a striking fact: Chicago, in an exodus story echoed across the rust belt, owns 15,000 vacant lots. The parcels, many of them on the South and West Sides, don’t generate tax revenue, but the city is obliged to maintain them. Outside the watch of homeowners, many are havens for illegal dumping, weeds, rodents, and street crime. Chicago hasn’t exactly turned a blind eye, says Brown, associate director of the University of Illinois at Chicago’s School of Architecture and the author of Noise Orders: Jazz, Improvisation, and Architecture. Through the Large Lot Program—a pilot that began in Chicago’s Englewood, East Garfield Park, and Austin neighborhoods—individuals and nonprofits that live on the same block as a city-owned vacant residential lot can buy select pieces of land for a dollar. It’s a compelling idea, and through it and the related Adjacent Neighbors Land Acquisition Program, about 1,000 lots have been purchased in the past five years. But Brown says the city can do more; he suggests thinking of architecture and urban planning like jazz: a formal compositional structure inside of which experimentation can take place. “I’ve had a long interest in improvisation: how improvisation is structured in music and how that sensibility can carry over and influence how we organize architecture and urban spaces,” he says. The novelty of Brown’s approach is that it considers vacant city and privately owned lots, typically 25 by 125 feet, in two- to five-lot sets, up to 13 stories tall. The reclassified property boundaries—an area equal to Chicago’s Loop in size—offer room for affordable housing, outdoor recreation, commercial development, and accessible collective public space. 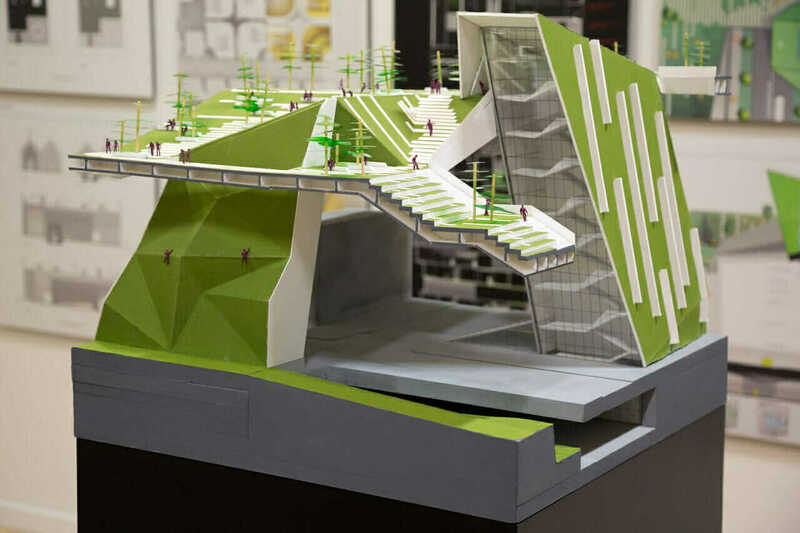 As part of the Biennial’s exhibition, BOLD: Alternative Scenarios for Chicago, nine firms were commissioned to interpret these rules in architectural models displayed at the Chicago Cultural Center. The exhibition’s KTC 234 design. Courtesy Francisco Gonzalez-Pulido (JAHN). Francisco Gonzalez-Pulido is the chief of design and president at JAHN. His design—“KTC 234” (Knowledge Trading Center), created in partnership with the German architect and structural engineer Werner Sobek—envisions a 24-hour global classroom made up of learning cells that facilitate knowledge trading. 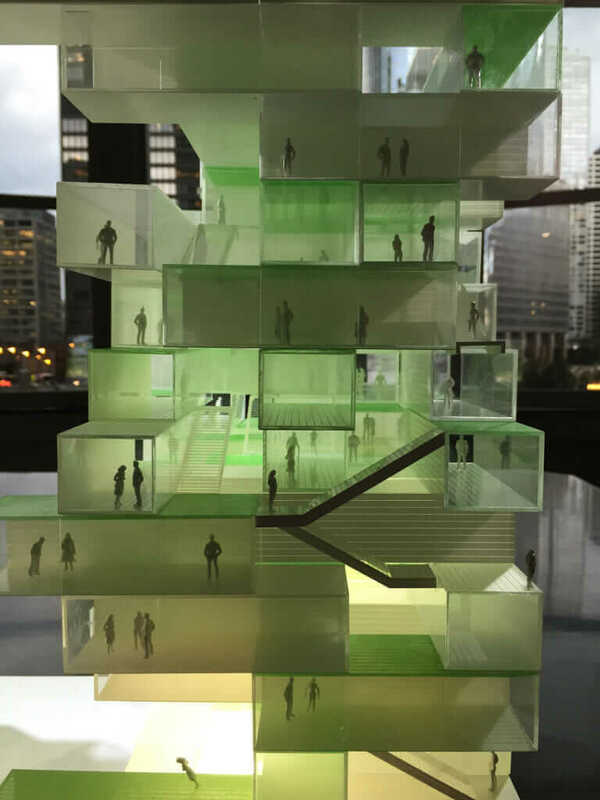 Imagined for development in a commercial district along the Chicago River and accessible by boat, bike, or foot, the high-performance building of resins and composites includes mother cells that generate energy and walls that get thinner and lighter at increasing heights. The nonhierarchical form mirrors its democratic function. Musicians, cooks, and app developers—or whoever wants to come by and trade expertise—can teach informal classes and earn knowledge credits to exchange for their own learning. 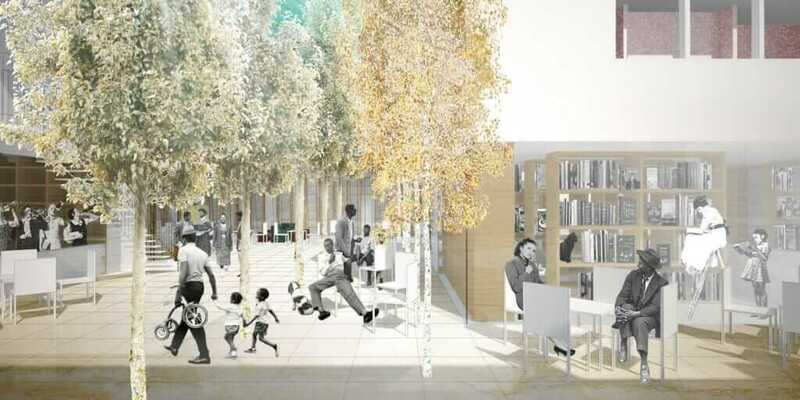 For Ania Jaworska, an independent architect and visiting assistant professor at the University of Illinois, the desire to unite people in a welcome atmosphere of free idea exchange is equally apparent. Her open-air pavilion borrows the pitched-roof typology of a home. Bounded by Grecian-style columns, an extruded plaza includes a long community table and conversation-pit space. The space provides room for a variety of functions, from block parties to barbeques. “I was really thinking about the basic need of people to gather around the fire and discuss ideas in an open-ended and serious way,” she says. Ania Jaworska design. Courtesy David Schalliol. Meanwhile, a topographical, multistrata design by architects Juan Gabriel Moreno, Miriam Neet, Dan Spore, Katie LaCourt, and Ted Jamiefield of JGMA reimagines a void within Humboldt Park in Chicago’s West Side. The park reflects the demographics of the rapidly gentrifying Latino neighborhood; it’s the site of a bird-friendly lagoon, soccer fields, food trucks, and the National Museum of Puerto Rican Arts & Culture. Targeting a 24-block area anchored by Norwegian American Hospital, JGMA’s vision integrates a constructed landscape of pools, vegetable gardens, and hills, extending the park south to W. Augusta Boulevard and east to N. California Avenue. A wellness-centered stratum connects park space to the hospital and surrounding community. That the space was not included in the original park framework of William Le Baron Jenney and Jens Jensen is an ironic twist on the idea of wellness and community. “Everything we want to do has to do with keeping people out of the hospital—rethinking nutrition and physical fitness, looking at programs for how we grow food, and providing places for swimming,” Moreno says. 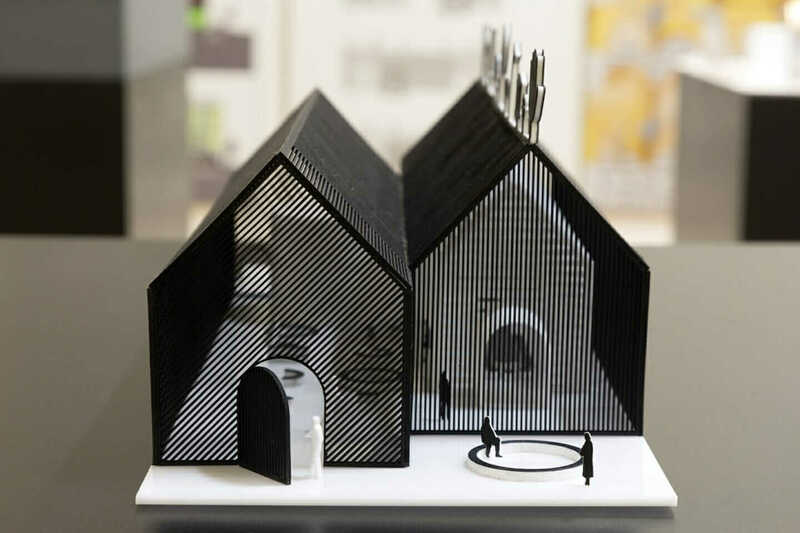 JGMA model. Courtesy David Schalliol. Other firms that took part in exhibition include 3D Design Studio, Central Standard Office of Design, Landon Bone Baker, Margaret McCurry, and Stanley Tigerman. Offering a more minimalist approach is Krueck + Sexton Architects’ “Chicago Boogie Woogie,” a novel take on microhousing. Architects Tom Jacobs, Mircea Eni, Sean Myung Shin Kim, Elias Logan, Don Semple, and Lindsey Telford connect five city lots to create a mixed-use residential space with the massing oriented toward the street. With the front setbacks reduced, the design preserves a rear courtyard. Inside, the design carves out shared social spaces, such as a game room and a formal dining room, which all occupants can access. Adult dormitories offer sleeping quarters for individuals of varied incomes. The exhibition display placard reads simply, “When you own a unit here, you own a bed, a living room, a dining room, a kitchen, a café, a restaurant, a florist, a barbershop, a workshop, a library. You own everything. Even an orchard.” It’s a fitting description for a collective space of shared ownership. The Available City’s “Chicago Boogie Woogie” concept. Courtesy Krueck + Sexton Architects. In theory, all of that sounds great. But will any of these ideas come to fruition? To ignite the imagination of city officials and encourage investment in vacant land and impoverished neighborhoods, these proposals ultimately need to arouse interest from private stakeholders, foundations, and community groups. That begins, Brown says, with rule changes in city leasing and easement structures that would allow resident groups, businesses, and wards to function as collective development entities, unburdened by traditional zoning classifications. Within two years, Brown says he’d like to see a freestanding, landscaped-based surface example as part of a city exposition that could motivate such jurisdictional rethinking. And there are other signs these responses may be more than just ideas on paper.